It’s been raining at the Casa del Whackos for the last two days; I have had no inclination to go outside and frolic, and dad has been putting an inordinate amount of time into finishing the book, so that has left me with plenty of opportunity to reflect on some of our recent adventures. Dad and I went to New Mexico back in December, “just because”, as sometimes we need to just stop, drop and roll; stop dead in our tracks, drop everything that’s clouding our minds and clogging our flow of mojo, and roll hard for points unknown. We are very fortunate that mom understands and anticipates these occasional outbreaks of wanderlust, and usually gives her blessing. I really think that she welcomes the chance to recuperate a bit from the constant dad and Charlie show, as it can be a bit overwhelming. Whether on one the bikes or in the old Subaru, it’s on the road to nowhere that we unplug and recharge. Its amazing how sometimes that simply turning an electronic device off for a time solves many problems by allowing it to reboot, and the brain functions in the same manner. Many think a trip out west is either an adrenaline-fueled death march or some sort of vision quest, but actually it can be neither, or a combination of both. It doesn’t matter the reason or the destination, what does matter is that we’re moving, and the more ground we cover, the more we can experience. This is especially true when we are willing to step outside of our comfort zones, or, if you will permit me to use the analogy of my former prison, our crates. Dad and I were rolling across a particularly desolate stretch of highway between Tres Piedras and Taos, New Mexico. This is one of our favorite places on the planet, as although the air is pure and arid, the atmosphere itself always seems full of anticipation. Sometimes you just have to slow down to appreciate it. We spotted a lone figure in the distance, and as we approached, discovered that it was an “interesting” looking character; imagine Abraham Lincoln with a backpack, a shock of unruly hair and beard topping off a 6’5″ frame that seemed to be all joints and hard edges. As we passed, the man put his thumb into the wind, and dad’s first inclination was to avert his gaze like the proverbial Pharisee and keep hammering towards Taos. But why were we here? Wasn’t this type of opportunity exactly the reason we were “out there” in the first place? Picking up hitch hikers in the middle of the desert is not something that is regarded as sane behaviour by most, but sometimes you just have to go against conventional wisdom and trust your gut. Besides, if he did decide to get sassy and start some trouble, I would hope that after fifty-five years of weird encounters, dad would have enough experience to handle the situation. And if not? Well, in that case, he might as well go ahead and be ready check out anyway. Besides, he had a secret weapon in the front seat, a fifty-five pound black force of nature named Charlie Bravo, and my life experience has ensured that I’m no slouch myself when it comes to discerning evil intentions. So dad whipped over onto the gravel shoulder, and the man opened the door and began to fold his angular frame into the small Subaru. Of course, this meant I had to give up my position as co-pilot, but I didn’t mind; I immediately picked up his vibe, if you will, and knew that this was was a kindred spirit. The only thing that kept me from crawling into his lap was his backpack wedged between his knobby knees. As the miles passed and we began to approach the Rio Grande Gorge, the conversation flowed effortlessly from one subject to the next, everything from the usually forbidden subject of religion to how to train cats not to crap in the sand close to your mobile home in the desert. When we parted ways at the bridge, we didn’t think to catch his name or take his picture; sometimes results are unimportant, it’s just the experience that’s important. As we prepared to pull away, the car that had been so cramped now felt curiously cavernous and empty. Before we could take our leave, the man caused us to jump when he suddenly appeared at my window. He gave dad a small rock, and told him that it was important, as it was a “starlight”, and if we would Google the meaning when we got into cell range, we would know why. Well, we had a flat shortly thereafter, and in the process of dealing with that minor setback, the small stone lay forgotten in the console. It wasn’t until we returned back to Arkansas that dad remembered to look up “starlight” on the Web. Nothing seemed to match the description of the odd little rock until last Saturday, when on the trip to pick up Claire the foster dog, mom thought to do a search by changing the spelling just a bit. 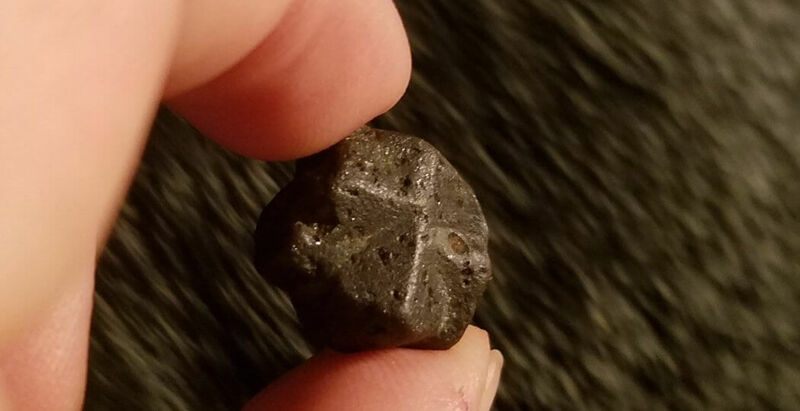 “Staurolite”, also known as “fairy crosses”, said to be the tears of the Cherokee, shed during the great exodus of the “Trail of Tears.” Another states that staurolite was in fact a “good luck” gift made to John Smith from Pocahontas. There are reports made that many well-known figures in modern times carried staurolite as a sort of talisman against evil, including but not limited to Theodore Roosevelt, Charles Lindberg and Thomas Edison. Pretty elite company, if I do say so myself. So now dad and I have our own, given freely to us by a supposedly random wayfaring stranger in the wilds of New Mexico. Do we believe that it has magical powers of some sort? Who knows; it’s too early to tell, and we may never know. What we do know is that it doesn’t matter a bit whether it does or does not, but what does matter that the man that gave it to us believed in something, and was willing to part with that something. Call it what you will, but from where I’m sitting, that sounds an awful lot like the definition of “faith” to this black dog. And you gotta have some!